Energy-efficiency regulations are billed as necessary to protect the environment. A new Mercatus Center study by Ted Gayer and W. Kip Viscusi looks at the recent wave of energy-efficiency mandates for products from cars to light bulbs. The study finds that these rules-by the regulators' own estimates-have a negligible effect on carbon emissions. Even the modest environmental benefits may be overstated because they are based on projected benefits to the world, not just to U.S. citizens. This appears to be the first time the U.S. government has employed this type of benefits measure. 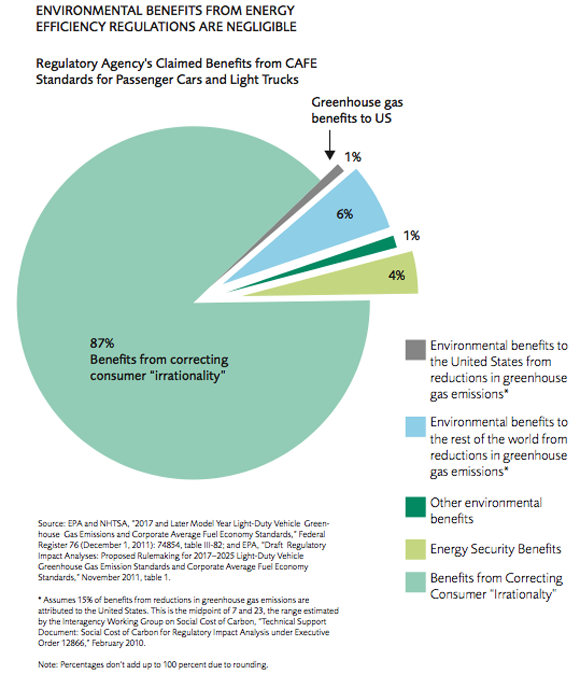 The largest claimed benefit of these energy-efficiency regulations is based on the agencies' presumption that consumers and firms make irrational purchasing decisions and therefore gain when regulations restrict their choices. Energy Regulations: Protecting "Irrational" Consumers From Themselves?